After a long winter break, it can seem like spring break is years away to students. A quirky Groundhog Day promotion is the perfect way to break up the monotony of studying and classes. We’ve created four unique ways to engage your students in-store and on social media. Choose the one that best fits your needs or combine them for extra fun! After the holidays, consumers are always looking for a good deal. Students who are arriving back on campus after winter break are no exception. Encourage them to come into your store for Groundhog Day to stock up on winter or spring gear depending on the groundhog’s prediction. Choose a Date: Because Groundhog Day falls on a Sunday this year, consider hosting the sale on the following day, February 3rd to get students in the store at the beginning of the week. Or, stretch the fun out all week with a variety of discounts on merchandise each day. Regardless of which date you choose, we recommend hosting the sale for the duration of your normal business hours. Choose Sale Items: You’ll want to select items for both predictions. For instance, choose sweatshirts and gloves in case the Groundhog foresees six more weeks of winter as well as sunglasses and t-shirts for an early spring. Follow a Timeline: Since this is most likely a one-day sale, it’s important to promote as early as possible to encourage student purchases. We recommend spreading the word at least a week ahead of time to ensure the maximum amount of students are reached. Promote: Spread the word across every channel you can think of. Our Promotional Kit will get you started with a customizable poster, a flyer to hand out in-store, a Facebook cover photo and a web image to post. Download it here. Who doesn’t love a good photo? Engage with your students and encourage interaction on your social media pages by hosting an “Overshadow the Groundhog” photo contest. Prompt students to share their best photo depicting themselves as a groundhog either seeing (or not seeing) their shadow! This unusual photo op is sure to bring lots of laughs and break them out of their routines. Choose a Channel: This contest can be run on Twitter, Instagram or Facebook. Select one specific site for the contest, or expand it to all of your social channels to reach a larger student audience. Select a Start Date: In order to give students enough time to create their photograph and vote, we recommend starting the contest the week before Groundhog Day and running it through the holiday. Determine Tracking: Decide how you will monitor entries into the contest. You can either have students post their photos directly to your page, email them to you or use hashtags. We suggest the latter as it’s quick and easy for everyone involved. If you opt to take this approach, ask students to use a hashtag such as #WhoNeedsPhil as well as a hashtag associated with your school or store name, such as #MBSUniv, to track participants while generating brand awareness. Announce the Contest: Kick off the fun with a short post on your social site(s) of choice with the contest rules and the hashtags students need to include in their entry. Promote: Spread the word across every channel you can think of. Our Promotional Kit will get you started with a customizable poster, a flyer to hand out in-store, a Facebook cover photo and web image. School Spirit Bonus: To encourage school spirit, opt to give an extra entry to students wearing school apparel in their photo entry. Select Prizes: Incentives encourage students to get involved. Offer students a gift card to your store or create a gift basket of products for the winner. 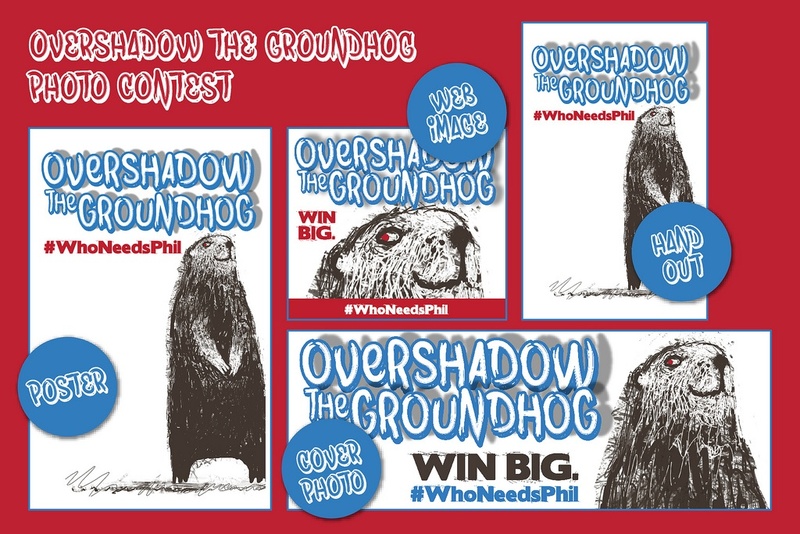 Identify a Winner: There are two ways to select the winner of the “Overshadow the Groundhog” contest: you can crown the photo entry with the most likes and comments as the winner, or opt to enter everyone who submitted a photo into a drawing for the prize. Keep in mind that if the contest is held across several social media outlets, then you will need to decide if you are awarding a winner for each or one grand prize. Announce the front runner through social media to create a buzz and tell them how to claim their prize. Wouldn’t it be cool if you had the ability to predict the future? The “Phil for a Day” social poll gives students a chance to predict whether or not Punxsutawney Phil will see his shadow. 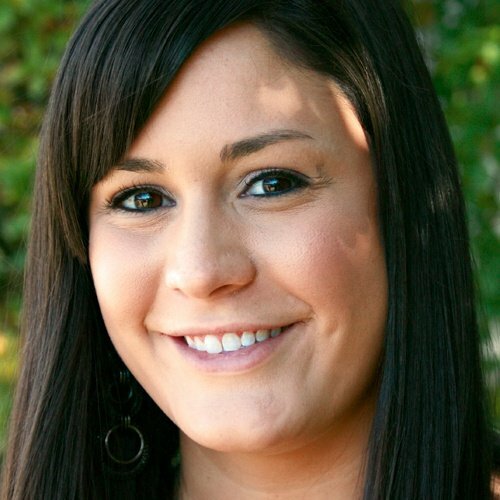 This interactive event helps your store engage students on social media. We suggest posting your question a day or two before Groundhog Day so students have enough time to vote. Select Prize: Choose winter or spring themed gear to award the winners according to Phil’s prediction. Choose the Winners: After Phil has made his prediction, we suggest you enter all of the students who correctly predicted the outcome into a drawing for prizes. Select as many winners as you like to receive designated merchandise from your store. Announce the drawing winners on your Facebook page to generate excitement and inform them of how to claim their prizes. Pick a Date: The day after Groundhog Day is an optimum time for the “Shorter Than the Shadow Sale.” However, you can also expand the event to offer multiple sales throughout the week to increase your customer reach. Choose Merchandise: After the Groundhog has made his prediction, select appropriate merchandise to place on sale. For instance, if the groundhog calls for an early spring, offer higher discounts on winter apparel to clear it from your store and have smaller discounts on spring items. Follow a Timeline: We recommend having 1-2 items on sale per hour (or day if you choose to expand the sale) so it’s easy to manage. Promote the sales as they occur on your Facebook and Twitter pages to increase followers and social media engagement. Promote: It’s important to promote the day of sales around your store and to alert students that the deals will be posted through your Facebook page. Use our Promotional Kit to get started with posters and flyers for your store as well as a Facebook cover photo and web image for your social media accounts. Have Some Fun: On the day of the sale, create a festive atmosphere! 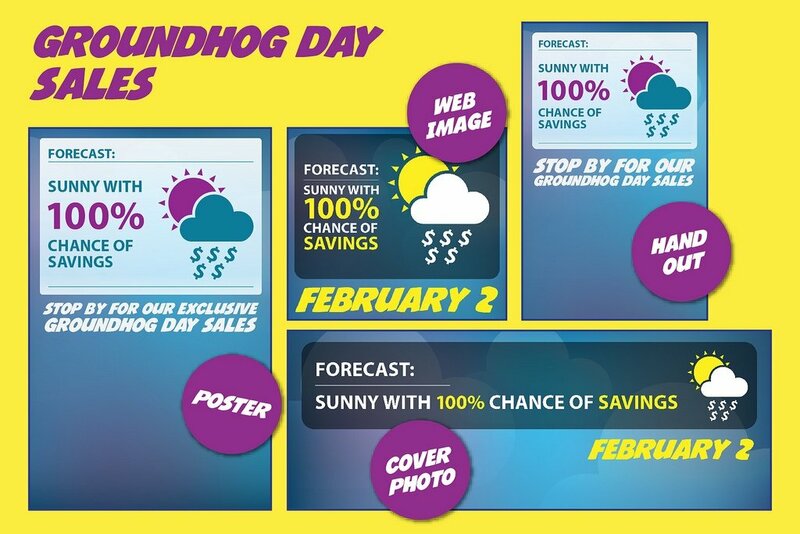 Ask employees to dress in either spring or winter apparel based on the Groundhog decision, play the movie Groundhog Day and/or provide a photo booth where students can post making their best Groundhog face; the options are endless!